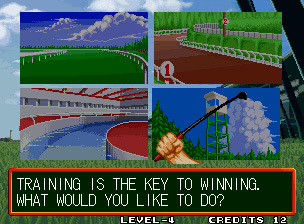 After one round of the horse racing game Stakes Winner 2, all gamers inevitably must ask themselves the same question: "What the hell was THAT all about?" 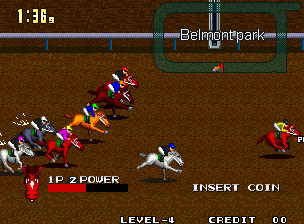 A niche title on a niche system, Stakes Winner 2 has unusual gameplay that only horse-racing otaku could love. 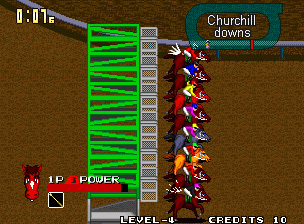 Premise: Horse racing games are quite popular in Japan and pretty much equus non grata in the U.S. Do you want to push buttons to make a horse gallop around a 2D track? America generally says no, but Japan and Europe say yes. But that's what Stakes Winner 2 offers--pushing one of three buttons to make your horse gallop fast, faster, or fastest. There's timing involved, as well as strategy. You'll not only need to weave through the pack, snagging speed and energy power-ups while avoiding collisions, but you must conserve your horse's energy as well. Players choose either a European or American circuit; the latter features such famed locales as the Kentucky Derby and the Preakness Stakes. Compared to the original Stakes Winner, which was little more than a string of races that earned you money, SW2 has better gameplay and lots of additions. On-track power-ups are easier to snag, but there is no warning of when they're coming and they spawn in a set pattern, so if you're not lucky the first time around, you'll know exactly where they are for the immediate retry. That's boring. 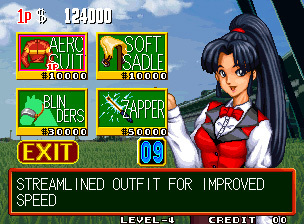 A new training mode offers mini-games that can permanently increase your horse's stats, and a stable shop give you something to do with that prize money, offering enhancements for sale like an electric prod to get you out of the gate faster or an aerodynamic suit to improve overall speed. Sadly, you can only buy one item before a race--even though you'll likely be flush with cash, you can't stock up, and the timer moves so fast, you might not get the chance to buy anything at all. These additions are all improvements over the original formula, but it's still difficult to feel like you're doing anything good on purpose, and the control, while responsive, is confusing and frustrating. Basically, you don't feel like you're much in control of the horse's actual performance at all. Much of the success comes down to grabbing the right power-up at the right time, and that's often sheer luck or memorization. While the horses are still cartoonish--especially the horse's face/status meter--they're less so than in the original Stakes Winner. The tracks all pretty much look alike (with the exception of the training games) and the menus are not animated. When the 2D horses round a simulated 3D turn, it's hard to keep your line. It also helps if you know how to read horse racing results off the scoreboard, because that's a big part of the visual presentation. Otherwise, it's just a bunch of color-swapped pony clones runnin' in a brown circle. Catchy, sprightly tunes with a lot of horns and grandeur set an appropriate tone. There's no colorful announcer, but you get the feeling that one would help the proceedings a lot. 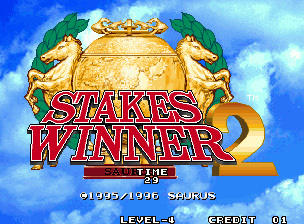 I found myself drawn back to Stakes Winner 2 over and over again, feeling like I'd missed something in the gameplay, that I didn't understand its appeal. Once I realized I hadn't missed anything and its appeal was limited at best, well, there went the replay value. Two-player racing didn't help much, either. But it's definitely more engaging than the original Stakes Winner, thanks to the ability to improve your horse's stats and buy jockey upgrades. 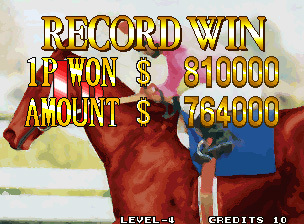 If you buy only one horse-racing MVS cartridge this year, well, Stakes Winner 2 should be it. 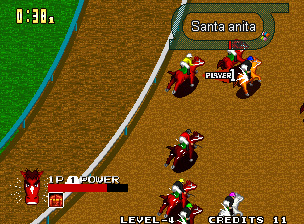 Of course, the chances of you buying any horse-racing MVS cartridge at all this year are probably slim to none, but there you go. It's a weird game, so it's of interest, but almost entirely as a novelty. 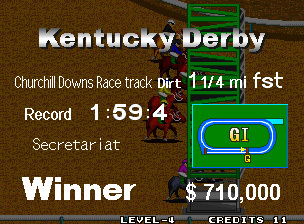 Only completist collectors and serious horse-racing fans will be interested in Stakes Winner 2, and even then, it's probably going to be a specific subset: the folks who played the original and said "You know what this game needs?"